Today fastcraft ltd the company behind the Assassin moth send out a press release announcing a new development of foils. The foils will be designed by Nick Holroyd , technical director of Team New Zealand. I actually knew this already 4 weeks ago but didn’t want to spoil the news. I am quite excited about this as Darren has agreed to sell the foils separately after the worlds. So finally home builders like me can get foils other than the aardvark ones. I am quite curious how those foils will turn out and what the price tag will be. Team Assassin is pleased to announce the worst best kept secret. Technical Director at Emirates Team NZ, Nick Holroyd, has come onboard and agreed to design a full set of ‘Assassin’ foils. Nick comes exceptionally highly qualified and has given the Assassin a special edge with highly advanced technology that is undeniably fast. There really is no need for introduction to Nick as I’m sure anyone in the know will know who Nick Holroyd is..
Nick is currently in his forth consecutive campaign with ETNZ. In the 2007 campaign he was a senior Naval Architect and was the design liason in the ‘Balance and Tuning’ group that was responsible for recording and optimising there sailing modes on the yacht. He was primarily responsible for the appendage design and general application of Computational Fluid Dynamics (CFD) in the 2000 and 2003 Americas Cup defences. We are very excited about this latest development. The foil design is an integral part of the international moth and we believe there is no better person for the job. Assassin has stepped up and is arguably the most highly spec’d hydrofoiling moth available in the world, with an unbeatable price tag. We thank Nick for coming onboard and supporting Assassin, proudly New Zealand designed and built. On Friday morning Carlo called me up. He was sitting with other mothies at a pizzeria reflecting on the races, I was standing at a Kinko’s in Los Angeles printing marketing brochures for the updcoming conference which will take place from Tuesday to Friday. It is a shame I couldn’t be at the the Stinietzsee regatta, especially as i now live in Berlin. Apparently the guys had a day with very little wind on the first day while Carlo told me that they had fun foiling on Friday. Unfortunately I still haven’t received the results (please email me to schulte(at)olapa.de if you got the results so I can put them online). As I didn’t want to stay in LA for the weekend (LA is an ugly city) Lukas and I decided to go for Vegas. Last time I have been here I was 17 and it wasn’t that exciting. Now that I am an adult by american standard (and I don’t need any fake IDs anymore Vegas is a lot more fun). Firstofall the Americans here are very tolerant. You can smoke everywhere, inside and outside. Also you can drink anywhere. If you drink alcohol on the streets Seattle the police would have a word with you. Also in most states you cannot go to a restaurant where alcohol is served with a minor. In Vegas no-one cares. This makes Vegas an awesome place for people like me who just hate stupid rules and regulations. I think money never leaves Vegas it is just flowing in from all over the world. Think about this business model – I am jealous…. Update: I just received an email from Lochli who pointed out one thing I got wrong: The compression struts itself now run into the mast pole so they can actually touch each other inside the pole” they dont touch, they rest in a hole in the plasice fitting, so they have the effect of touching but not! Also the shroud fitting will only be replaced on Lochli’s boat – it will be the same on all production boats. Since I returned from New Zealand I have been incredibly busy. I managed to sail 2 days, but could only foil temporarily as there was the typical lack of wind. In between I returned to a full desk, loads of unanswered emails, employees who demanded a lot of attention. Additionally I had to do the follow up from the New Zealand conference and I had to find a new apartment. Today I picked up our new booth and modeled a bit. 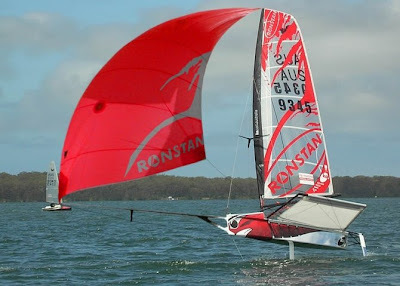 This is the first Mach2 that has been sailed by Si Payne during the Australian nationals. Now this boat was sold to Lochli Byrne who currently works for Amac. So this boat is not the very last, final version, but it is damn close. Firstofall let me tell you something about the look of the Mach2. It is all clear, bi-directional carbon. So from the distance it looks like pure black, but depending on the light you can see many different shades. it is really cool. The wing frame is definitely something Amac has put a lot of thought into. First of all the side wingbars are not a straight tube but actually become bigger towards the middle, which is really nice when you sit on them. Unfortunately I don’t have a picture, as the tramps were fastened around it and you couldn’t see it – but feeling it is awesome. Also the side wingbars are attached to the frong wingbars at the joint of the front bar and the compression strut. The compression struts rest in a hole in the plasice fitting, so they have the effect of touching but not. The gantry is a tube construction that is covered with some carbon expanse to keep the water off. the three tubes now run into the boat which is a real good idea to attach it tightly. The vang is now attached to the hull with a spliced rope that runs around the bottom of the mast pole. It is really difficult to see. By the way you don’t need any knots on the Mach2 – everything is spliced. and here another one of the way the sheet attaches to the boom. Awesome isn’t it? Now let me show you some more details about the amazing bow of the Mach2: First of all the new central wand mechanism allows you to have two wands, one on either side. This is also possible with the Assassin. I haven’t tried it but Lochli said that he will always sail with two wands in the future as you can actually come out of the water as high on either bow. The big hole you are seeing is a spare one so you can run a rope to the front. For example to tighten the forestay while sailing. To reduce windage you can put a small piece of carbon on top of the whole mechanism which looks awesome (I know you know these pictures, but I took this one Actually I am really amazed by the whole wave piercing A-Cat like bow. It really works. I tried sailing the Mach2 in big waves (typical for Melbourne) and the big difference is that you get out of the water faster as you are not doing a full stop every time you hit a wave. I love it. It is a big, huge advantage. Now the whole winding is taken care of with stainless steal winding molded into the foils – good idea.. The flap is a bit smaller but the up and down movement has been increased. to make a long story short, the Mach 2 is an awesome boat. It is really good to sail (but that is another article) and has been build to the best standards. Unfortunately the price is also the best (at least for Amac and McConaghy). My personal believe is that you cannot do anything wrong when buying a Mach2. I wonder if you find out how this is done… I still believe that this Prowler from Rohan is the best looking moth ever! Unfortunately this comes with a price – Lochlin told me that the stickers on the hull added 2,5kg (updated) to the overall weight. I wonder how she foils…. You are currently browsing the foilermoth blog archives for May, 2009.